Come one, come all! The Pilotenkueche International Art Program’s group exhibition “Unfinished Hase” opens next Friday, the 23.02.19! I will be performing two performance works, one alongside musician Ben Osborn. My work in this show is generously supported by the British Columbia Arts Council. 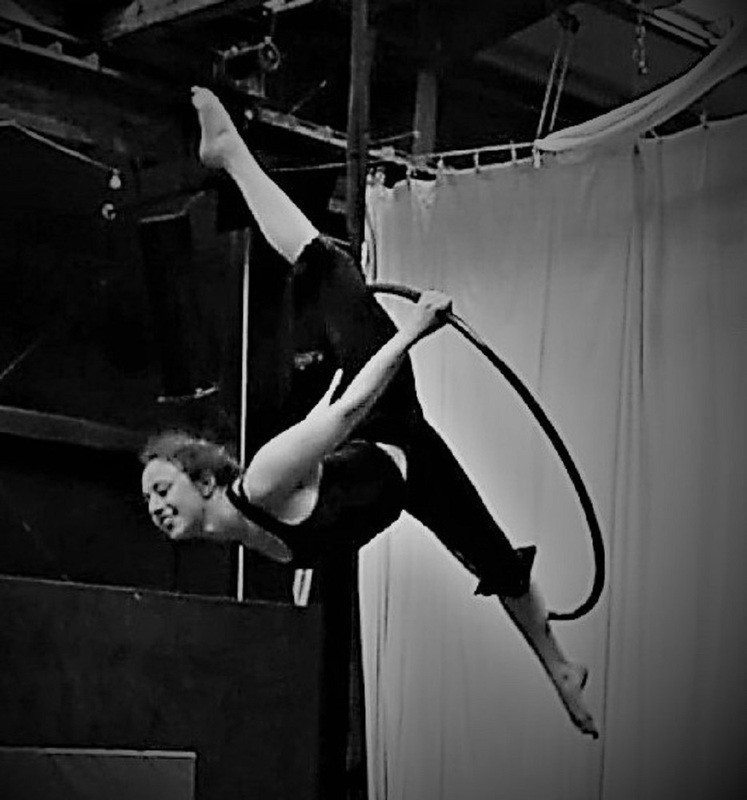 This workshop will focus on three fundamental groups of tricks on aerial hoop and/or trapeze: momentum moves (beats, monkey rolls, hip circles, elbow circles); balances (front balances, back balances and variations, bum balances); and hangs (toe hangs, heel hangs, elbow hangs, neck hangs). Students will be given exercises to work toward acquiring all of these skills during their own personal training. Wonderful organization and awesome flyer created by Salt & Pepper Artists, München (https://www.instagram.com/saltandpepper.artists/)! I would like to gratefully acknowledge the support of the British Columbia Arts Council (http://www.bcartscouncil.ca/). With their assistance I am currently creating a research-based visual project at the Pilotenkueche International Art Program in Leipzig, Germany. I will post more about this project— entitled Re-Emergence— in the months to follow. Circus students and emerging professionals in Helsinki: Please join me for a workshop on Sunday November 25! We will focus on three elements of good choreography: smooth and interesting transitions; conveying meaning through movement; and last but not least musicality! Please find the details below, and visit http://www.circushelsinki.fi/workshop-aerial-hoop-and-trapeze-choreography/ for more information and to register. BC Arts Council's Early Career Development Program award!!! I am amazed and overjoyed to announce that I am a recipient of this year’s BC Arts Council Early Career Development Program award!!! The funding provided by this award will fully support my participation in the Pilotenkueche International Art Program in Leipzig, Germany from January to March 2019. Please stay updated in the coming months for more information about the Early Career Development Program, the Pilotenkueche International Art Program, and the work I will produce and exhibit there. I’d like to thank the Government of British Columbia and the BC Arts Council for their generous support. Yay! My first solo exhibition, "Rise and Fall" / "Nousu ja Lasku" will begin on Monday 02.07.18 at the Kemijärvi Art Residence (Kemijärvi, Lapland, Finland)! Exhibited will be a series of paper-based works inspired by the natural landscape of the Kemijärvi area, in addition to a two-part research-based work-in-progress entitled "The Rise and Fall of the Third Reich" (please see images and descriptions of this work here: https://www.eliana-sofia.com/postholocaust-art-2/#/the-rise-and-fall-of-the-third-reich/ and here: https://www.eliana-sofia.com/postholocaust-art-2/#/the-rise-and-fall-of-the-third-reich-mobile/). Don't miss the opening on Monday July 2 from 17.00 to 20.00! (There might be an a cappella vocal performance... no promises, though.) See below for address and details. Please email elianajacobs0@gmail.com or call +358 41 471 5427 for more information from me personally. I look forward to seeing you there!